"My dear Watson, how does one go about kissing a woman? "......Sherlock Holmes' question leads to a lesson Watson never expected to teach. And feelings he never thought to explore. A single kiss alters Watson's world while the announcement of Holmes' upcoming marriage sets an odd fear in his heart. Amidst the beauty of an English country party, the greatest detective the world has ever known searches for a traitor. Somewhere among the glittering nobility a sadist lurks, using blackmail to destroy lives and endanger a nation. Only Sherlock Holmes can save an innocent man and bring the traitor to justice. It's a search that could cement the greatest friendship of all time into something far deeper and stronger...if the hunt doesn't end Watson's life first. It seems delightfully in character that Sherlock Holmes would launch this story by precipitating a change in his and Watson's relationship in the name of acquiring information. 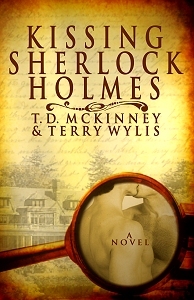 While Kissing Sherlock Holmes does not break new ground in assuming a homosexual attraction between them, TD McKinney and Terry Wylis do provide a sexually charged pastiche with a mystery to solve. The mystery elements have a well-weighted share of page time: the problem is worthy of Sherlock Holmes' attention before Watson arrives at Toddington Oaks. Once he's there, the danger is no longer confined to treason and blackmail, but becomes personal when a freshly kissed Watson is repeatedly endangered. The culprit becomes evident far too early in the book, but there is a certain entertainment value to watching Holmes flounder around before he figures it out. The authors pay attention to the late Victorian sensibilities very well at some times, though not so well at others. Holmes and Watson pay lip service to not being caught, but when they are found out by one person, Watson does not even contemplate the possible consequences, and not because they are too horrid to think about. The entire matter takes on the same social importance as spitting in the potted plants – it disappears entirely. The "whirlwind romance" of a few weeks from first meeting to wedding that Holmes and Winnifred are planning would have been a scandal; everyone would have assumed he'd gotten her pregnant with such a short engagement. Yet Holmes does play the stern male authority figure, putting her in her place when she steps out of the assigned female role. The unfolding of Holmes and Watson's physical explorations is very sweetly done – they need to invent everything for themselves, every small touch is new and wondrous. The change in their relationship is marked with vast numbers of "darlings" and "dearests" which rather stepped on the sheer intimacy of Holmes using Watson's given name. I boggled at Watson using "darling" in front of another person, no matter how sympathetic that person was. The language, "darlings" aside, matched the tone of Holmes canon nicely, and the ending was certainly the best that could be hoped for as far as the Toddingham family was concerned. The mystery was tragic in the classical sense, being made inevitable by the character's fatal flaw; I had sympathy for the villain, though to explain why is a spoiler. Some of the villainous behavior was just over the top, requiring a huge amount of collusion from other parties, and could have been dispensed with.